Play Captures Life Under South African Apartheid This summer, at the Culture Project in New York City, five South African actors are telling their "true life" stories about growing up under apartheid. The piece is called Amajuba : Like Doves We Rise. This summer, at the Culture Project in New York City, five South African actors are telling their "true life" stories about growing up under apartheid. The piece is called Amajuba : Like Doves We Rise. Amajuba cast members (from left): Tshallo Chokwe, Philip Tindisa, Roelf Matlala, Jabu Tshabalala and Bongi Mpongwana. This summer at the Culture Project in New York City, five South African actors are telling their true-life stories about growing up under apartheid. The piece is called Amajuba: Like Doves We Rise. From New York, Trey Kay reports. Unidentified Woman #1 (Actor): All my life, I've waited for the moment when the future would arrive. As a girl, I knew that someday the present would be the past, and I wanted the present to pass. The five stories in the play Amajuba are intensely personal, but at the same time they encompass the experience of millions of black South Africans living under the apartheid system, which officially ended in 1994. They tell of rural families impoverished and broken by a brutal migratory labor system, or the poisonous tension of youth in cramped townships. Mr. TSHALLO CHOKWE (Performer, Amajuba: Like Doves We Rise): We're like roaring young lions. We're like boiling. You wouldn't stop me even if you tried by all means. KAY: While 15-year-old Tshallo Chokwe gathered with rebellious young people in a township outside of Pretoria, far away in a rural village, Bongeka Mpongwana, or Bongi(ph) as she's called, was literally eeking an existence from the ground. I can tell you we used to eat grass like cows because it was sweet. You used to get full from grass. All these other kids you would not even tell them that, okay, guys, there's no food at home. But you would eat grass probably for lunch, and then probably for supper you would eat the wild spinach. We used to cook it. KAY: Each story in Amajuba is the actual experience of the person who tells it. Ms. YAEL FARBER (Playwright and Director, Amajuba: Like Doves We Rise): With Amajuba, it's the backbone, it's the integrity of the work. It's that who you are seeing has lived these experiences. KAY: Playwright and director Yael Farber is internationally known for creating powerful works about the South African experience. In 2000, a local arts council commissioned her to create a new play and provided her with five actors. Ms. FARBER: All I did was say to them would they be willing to share their stories with me, and they said yes. It's testament to the fact that people have extraordinary stories to tell in South Africa. I didn't wade through 300 people and choose which stories would suit the agenda. KAY: Over a six-week period, which Farber describes as grueling, she plied the actors with tough questions, focused on minute details of the most painful recollections, like this one from cast member Tshallo Chokwe. Mr. CHOKWE: When I was a child, I was afraid of the dark. I (unintelligible) at night. My uncle would ask me, what is this (unintelligible) you are afraid of? You must find out so that you can fight him. One night, he left me out in the dark. It was really hard work. It was like probing, you know, getting into someone's private life. We cried in the (unintelligible) room. We felt like very desperate. It wasn't fun. KAY: Amajuba continues a tradition of South African theatre, which began in the 1960s, in which writers and actors collaborate to produce a play. Athol Fugard worked this way when he made Sizwe Bansi is Dead and The Island. So did the late Barney Simon in creating Born in the RSA and Woza Albert. 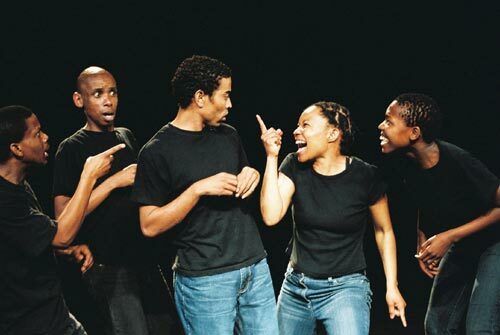 These biographical workshop techniques spurred a uniquely potent brand of protest theatre during the days of apartheid. Ms. ADRIAN SIZEL(ph) (Journalist): Actors were seen acting to the streets. They would use tape recorders or they would write down the material and then enter this material into a play. KAY: Adrian Sizel is a journalist who writes about South African theatre. She says though the methods are the same, there's an important difference between the plays created under apartheid and those from the post-apartheid era. Plays during apartheid focused on raising consciousness and giving voice to the voiceless. Post-apartheid plays like Amajuba, she says, are in the spirit of the country's Truth and Reconciliation Commission, or TRC, and are meant to convey a message, even to some who are reluctant to hear it. Ms. SIZEL: We as people kind of saturated to the kind of coverage we got on radio. And people would have a knee-jerk reaction to reading and hearing about the TRC. When you see these experience personalized so deeply in theatre, it could change minds and hearts; it certainly has that kind of healing aspect to it. KAY: Yael Farber says that she's experienced in her fellow South Africans ambivalence towards looking back at the devastation of apartheid. She symbolically and ritualistically addresses this by dressing Amajuba's stage with an assortment of enamel washing bowls. These bowls were common to each actor who grew up in places with no water. Unidentified Man #3 (Actor): Growing up in the townships, washing was no simple matter. All that we had was that small enamel bowl. And no matter how hard I tried, I couldn't reach around to clean my back. So I decided to forget what's behind me and concentrate on making my front look good. KAY: During the course of the show, dusty sand is shoveled onto the stage. It creates a dry mist that harkens back to the arid dust of South African townships. The dust forms a visible grime on the perspiring actors. Unidentified Man #4 (Actor): We cannot leave things in the dust without a decent burial, no matter how small. We all have to stand in the rain and wash away the pain. Like a huge grave, we have to dig and reclaim what was once forgotten or cast aside. And from the dust, like doves we will rise. KAY: Amajuba: Like Doves We Rise will be at the Culture Project in New York City through the end of August, and there are plans for a U.S. tour in 2007. For NPR News, I'm Trey Kay in New York. GONYEA: This is MORNING EDITION from NPR News. I'm Don Gonyea.